The knife? I’ll never tell. It wasn’t me… I wasn’t even there. It was somebody who looked like me. That’s my story and I’m sticking to it. What? They put desktops back ON the desk again? After 20 years. what will they think of next? Used to run both. Switched to just using a laptop with a big monitor at home. Easier. I actually went out of my way to find a non-tower case – I’m just a freak. I’ve always liked desktop cases because I’m tall and it gives me a place to stack my monitor. I did consider going to a laptop/monitor combination, but I use some pretty processor-and-display-intensive applications. I would’ve had to pay thousands of dollars for a laptop, and even then it wouldn’t be close to the specs of the desktop I put together for under a grand. Technology. Grrr. Luv the post Diane hit home for sure! Speaking of technology – just got home from my 91 year old mothers. The thanksgiving dinner was a breeze, programming the new flat screen TV took three days, getting her elderly XP/OS system sorted out another 2 days….if a machete had been close by it would have been cheerfully employed. Luv technology but when it goes awry, murderous thoughts arise, glad you have them too and you know what your doing LOL. Enjoy your new desktop! My favorite thing to do every couple years is build my new tower. Sadly my next investment will be a laptop. I spend too much time in barracks or in the field to have anything else. You may laugh but i have set up my tower in the field under a section of mod tent in the middle of january. It ended with a blown CPU from getting snow kicked into the fan. Lol I think i will stick to the one i have. Your new one looks nice though! What puzzles me is why your old computer decided to die on a bed. Has it never heard of a static safe work environment? Well, dang. It must’ve dragged itself in there and fried its little circuits climbing up on that static-generating synthetic-blend bedspread. And here I was thinking it died from a machete to the guts. I am not sure what makes me feel more inadequate – your hilarious writing, your ability to Frankenstein your computer, or your insanely neat office. I bow to you! I’m told a clean desk is the sign of a sick mind, though… and I don’t think I can plausibly argue with that. At least you’re getting there, Diane… and all that aside hope you had a good Thanksgiving! 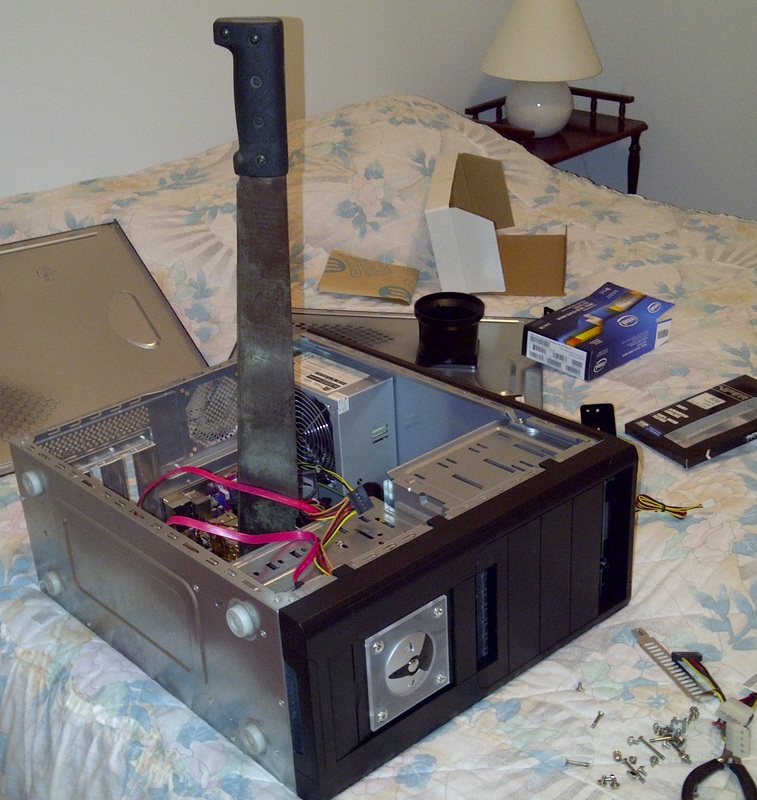 I hope you’ve left the dearly departed computer in the corner of your office with the machete intact to, you know, encourage good behavior on the part of the new computer. Oh, good thinking! Nothing like a little motivation. There is no substitute for a good machete. Well, at least you’re technology savvy. Think of the rest of us poor saps who have no clue what we’re doing. Loved the stabbing of the machine, by the way. I would expect no less from you. 🙂 Am also hugely impressed by your neat workspace. 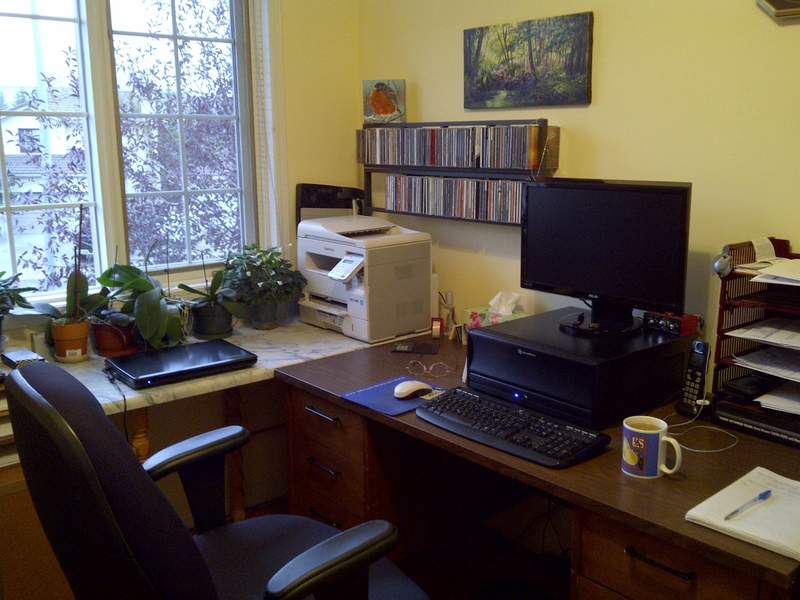 I require neatness in my home–just ask my poor kids–but for some reason, my desk never shows it. Yeah, I’ve had to learn to avoid my sons’ rooms. I do make them clean them, but I also understand it’s their space. Argh! See, this is why I hate computers–that whole seppuku thing. Who knew the beasts put such store in honor? Glad you got your new one built & running!